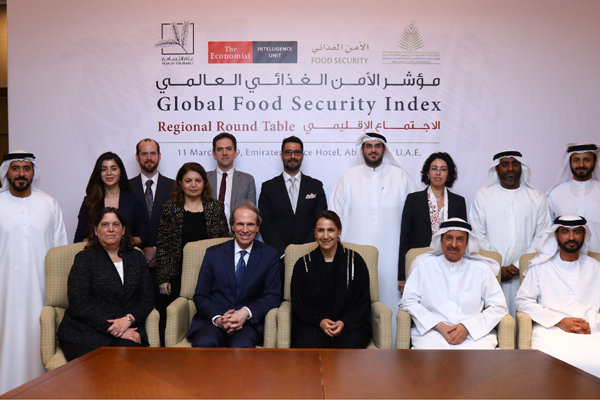 The UAE’s bid to become one of the world’s top 10 food secure nations took a major step forward, when Mariam Almheiri, Minister of State for Food Security, released an innovation-driven food security roadmap for the Middle East. Designed to further the objectives of the UAE’s National Food Security Strategy and to support regional improvement in this important portfolio, the roadmap relies on five pillars: building a food data strategy; developing an innovation research and development (R&D) strategy; establishing a national food waste programme; expanding nutritional guidelines; and enhancing the regional trading environment. The roadmap was launched during a high-profile meeting that brought Mariam Almheiri together with the team from the Economist Intelligence Unit (EIU), as well as Dr Hussein Abdul Rahman Al Rand, assistant undersecretary for the Health Centers and Clinics Sector at the Ministry of Health and Prevention; Saeed Al Bahri Salem Al Ameri, director general of Abu Dhabi Food Control Authority; Abdul Qadir Al Meini, director general of the Emirates Standards and Metrology Authority; and a host of prominent experts and specialists. “This roadmap will help us make targeted interventions and is expected to be a valuable tool that will assist with our ambition of improving on our current position of 31st in the global food security rankings to being within the top 10 by 2021,” she added. During the meeting, Almheiri and strategic stakeholders relayed the government’s food security initiatives, with contributions from the Federal Competitiveness and Statistics Authority, the Ministry of Health and Prevention, Abu Dhabi Food Control Authority and the Food Security Center – Abu Dhabi, amongst others. The participating representatives looked at developing food-security-related data guidelines and an R&D strategy that focuses on biotechnology. They also examined how to best support national and regional strategies to reduce food waste, how to enhance nutritional guidelines to improve the quality of diets and how to draw up an agricultural trade strategy that positions the UAE as a regional trading hub for food in the Middle East. The meeting represented the first of what will be a series of discussions between the UAE’s Food Security stakeholders and The Economist Intelligence Unit moving forward.